How Many Clothes Should I Pack for a 2-Week Trip? At home, how often do you launder your clothes? Probably more often than you should. Besides undergarments and athletic apparel, you can wear shirts and pants at least three times hygienically. Although you may prefer to switch your wardrobe daily, doing so on vacation doesn’t make sense. Any trip over a week becomes cumbersome when it involves a dozen or more outfits. Most vacationers over-pack instinctively. They fret over not having something appropriate to wear at all times. Unfortunately, over-packing often results in hefty luggage fees and travel strain. So here’s some ways of identifying the necessary and the superfluous. Without knowing the weather forecast, how will you know what to pack? Of course, leave room for error—the weather channel rarely gets every day right. In hot climates, you might need a greater variety of clothes: sweat reduces the lifespan of each shirt. Conversely, colder climates—despite requiring more clothes—make it easier to pack lightly. When layering for warmth, you get more versatility out of your wardrobe and extend the number of uses per layer. Perrotta goes on to distinguish “must-haves” from “what-ifs”—the latter comprising the 80 percent of underused clothing. Thinking of each item in such a way can quickly reduce suitcase bloat. When packing for extended vacations, the best fabrics are quick to dry, lightweight and breathable. Should you need to do laundry after the first week, these fabrics make it easier. Similarly, such clothing can be rolled to save space in the suitcase. More importantly, bring clothes that coordinate well together. This applies not only to complete outfits, but also combinations of them. Ideally, three shirts and three pants should equal nine outfits. Using a similar formula, Abby Stone from Apartment Therapy recommends 5 bottoms and 15 tops for a two-week vacation. 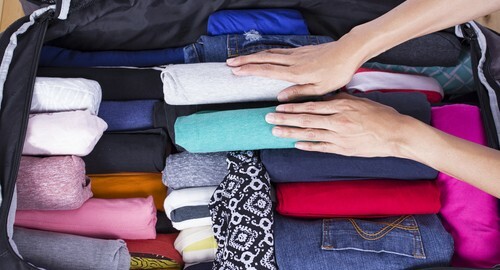 You can probably scale back the shirts if layering or planning to wash during your trip.